This title is an essential reference work for all those involved in the distribution of medicines in Europe. It reproduces relevant parts of Rules and Guidance for Pharmaceutical Manufacturers and Distributors (commonly known as the Orange Guide) specific to wholesale supply and distribution of medicines for human use. 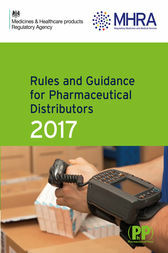 It is compiled by the UK drug regulatory body, MHRA, and contains official EU guidance on good distribution practice and wholesale distribution along with relevant information on EU and UK legislation. It brings together the main pharmaceutical regulations, directives and guidance which manufacturers and wholesalers are expected to follow when distributing medicinal products within Europe. There have been significant changes and additions to the detailed European Community guidelines on Good Distribution Practice (GDP) as well as substantial amendments to the Community code relating to medicinal products for human use. This new edition covers these important changes as well as featuring the addition of the Guidelines on principles of Good Distribution Practice of active substances for medicinal products for human use (2015/C 95/01).